Did you know that Pfaltzgraff is celebrating its 200th Anniversary this year? For that reason; this review is going to be a little different than my normal (witty) delivery of information. The Pfaltzgraff history is such a great example of shear human determination and a strong sense of purpose; that I feel it needs to be shared. How many of us can say that we are a part of something that has withstood the test of time, adapted to current consumer needs and lasted 200 years? In an effort to promote this strong, human spirit; I am going to try and do justice to the rich history of Pfaltzgraff. In May of 1833 Johann George Pfaltzgraff and his wife, Helwig Elenora (German Immigrants) boarded a ship heading for America armed with a dream to establish his own pottery business. Four long months later, they landed in Baltimore, MD. Johann and Helwig were not the first of the Pfaltzgraff family to reside in the U.S. They did have a relative, living in York County, PA., whose name was George Pfaltzgraff. It is George who is cited for already having, established his own pottery company back in 1811 (thus the 200th Anniversary). Moving things forward a bit; in 1835 Johann moved to Conewago Township where he owned a small pottery which produced crocks, jugs and jars for food storage. Then in 1848 Johann moved his family to Foustown, PA in order to expand his small pottery business. It is noted; the 1870 Manufacturer’s Census reported that Pfaltzgraff and Son Pottery” had produced a, whopping, $1000 worth of pottery! That was an astounding figure for the times. Sadly, in 1873, Johann George Pfaltzgraff died. His three eldest sons, John B., George B., and Henry B., are the ones responsible for carrying on the family’s legacy. In 1906, what was then known as the “Pfaltzgraff Stoneware Company,” was nearly destroyed by a fire. It is thought that a disgruntled employee started the blaze. After rebuilding the factory in its new location (West York, PA), it was re-opened and named “The Pfaltzgraff Pottery Company” which was known for its clay flower pots, and even liquor jugs. Due to Prohibition; their liquor jug business had to be transitioned into providing their jugs for “home use only”. Fun Fact: Did you know that the “Anti Saloon League”, founded in 1893 (Oberlin, Ohio) then relocated to my (now hometown of Westerville, Ohio) was primarily responsible for the beginning of Prohibition? In 1913, in a 20th anniversary convention held in Columbus, Ohio, the League announced its campaign to achieve national prohibition through a constitutional amendment. It wasn’t until 1964 that the company dropped the word “Pottery” from its name and became; what it is known as today, simply “The Pfaltzgraff Company”. In 1988 the Pfaltzgraff Company began producing bone china, and as they would say, “the rest is history”. We all know the name. Now; we also know a little bit more about how it came to be. Today; the Pfaltzgraff Company is owned by Lifetime Brands, a formidable company in its own right. “In order to celebrate the Pfaltzgraff Bicentennial, Lifetime Brands has reissued two popular designs – Heritage and Yorktowne – in 32-piece anniversary sets. Pfaltzgraff has now even set up a Facebook page; so you can check out what’s new, including the place setting featured in this review. The design we are reviewing is the Pistoulet Line which was debuted in 2002. In my opinion; all of their designs are beautiful and functional. I would be proud to have any of the Pfaltzgraff sets in my home. They offer such diversity in styles; there should be a set that fits everyone’s unique style and décor. For purposes of conducting this product review; I am the proud recipient of Pfaltzgraff’s Pistoulet Dinnerware Set (40 pieces). The MSRP for this set is $568.00. It is now on sale for only $249.99 right on their website. This set of dinnerware, serveware and accessories are offered in two, distinct, color schemes. Each place setting includes: a 10-3/4” dia. Dinner Plate, 9” dia. Salad Plate, 28oz. 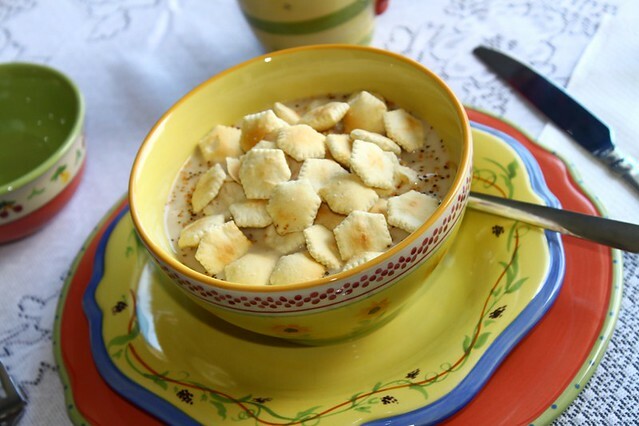 Soup/Cereal Bowl, 14oz. Mug and an 8oz. Dessert Bowl. The pieces are all dishwasher and microwave safe. 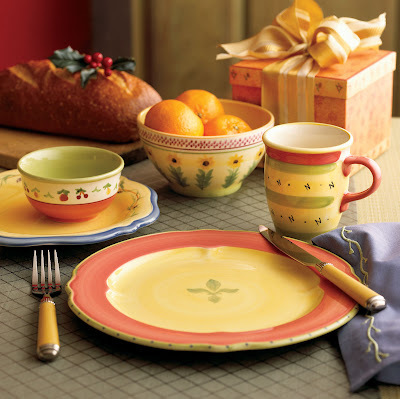 This is an elegant dinnerware set, enveloped in colors inspired by the subtle washed watercolors of Southern France. It features brightly colored vines, flowers and vegetables influenced by Jana Kolpen’s book, “The Secrets of Pistoulet”. I love the way that the light lines, almost seem effortlessly, laced around the Salad Plates. The subtle colors are very complimentary to the theme. The entire set really does give you an overall sense of what it must be like to experience the fields of Southern France. It creates an atmosphere of almost being there, sharing a great meal with family and friends and taking in the beauty of the French countryside. 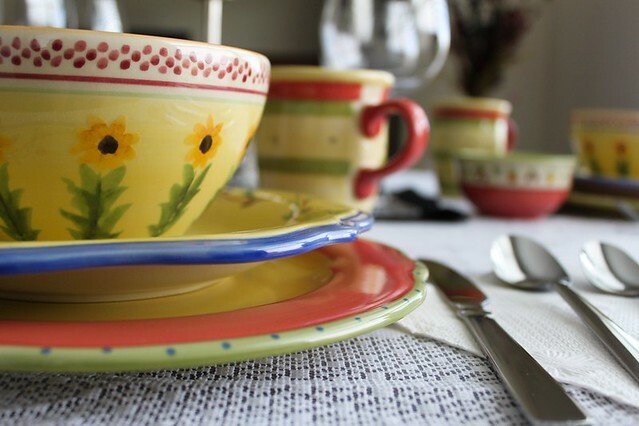 I really love the overall “feel” of this dinnerware. It has an elegant appearance about it. You can sense the thought that went into the design of each and every piece. It is functional and beautiful, all at the same time. The pattern of these pieces invokes a feeling of family and good times, spent around the dinner table, as a child. Much like its inspiration “The Secrets of Pistoulet” it’s almost a comforting state of being. The best way to describe it is; it’s like a, really good book. Now that I know the story behind it; I have an even greater appreciation for it. Note: Stylized illustrations provided for review purposes. Wine/Glasses not included. 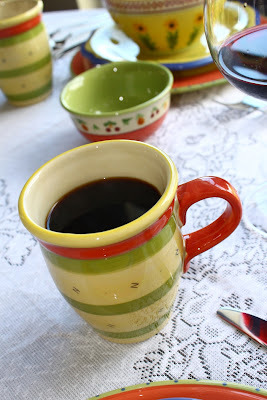 One Momma Told Me follower will win the same 40 Piece Pistoulet Dinnerware Set, as reviewed above, a $568 value. I'd love the 9 Cup Perfect Brownie Pans, Set of 2 for both brownies and corn bread. Love the On Deck Nautical Shooter glasses!! I like the Winterberry oval buffet plates. I love all their things!! What great craftmanship. Thank you for the giveaway. I love the Blue Meadows dinnerwear set! I would like to have some of their holiday dishes. They look so pretty & festive. I especially like the Evergreen Ernie snowman! Thanks for this wonderful giveaway!! 9 Cup Perfect Brownie Pans, Set of 2. I like the Simplicity flatware. It would go with these dishes & with my Simplicity China. Perfect teas service for one! I really like the White Covered Casserole, 3 qt. I use alot of covered dishes in the winter! I like the Blue Meadows pattern. 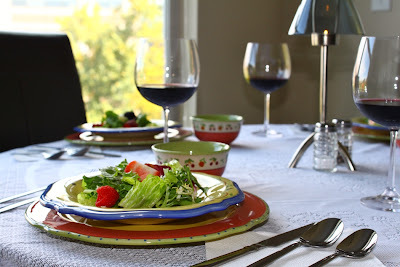 I love the rio dinner pattern and would love a placesetting in that. I also like the Blue Meadows 16 Piece Dinnerware Set. I've always been fond of the color blue in a kitchen. I like the Loop 2 Piece Serving Set! I'd love to have any one of the Plymouth serving pieces that look like veggies. I especially like the Pumpkin Covered Casserole. I also like the Yorktowne pattern. The WinterBerry Pattern is very pretty. I also would love to have the Naploi pattern dishes. I'd love the Pumpkin casserole dish! I love making cookies, so the Slider Cookie sheet looks really cool to me! I love love LOVE the Winterberry set!! I like the Plymouth Yellow Corn Covered Server. 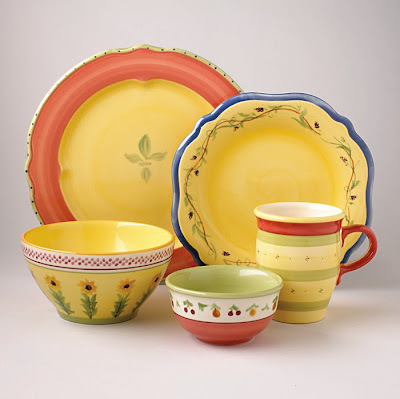 I'd love to get the entire Flora Gold Dinnerware Set! I love the Plymouth Sculpted 2 Qt Casserole Dish. It's very pretty! 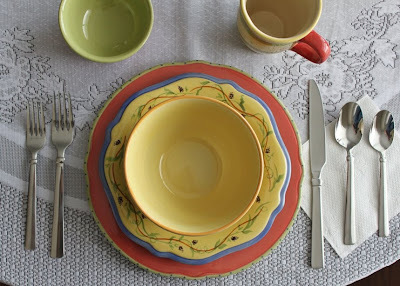 I would absolutely love to have the "French Quarter" Dinnerware set! It is absolutely stunning! Anissa 32 Piece Set. Thanks! I love all the pictures you put in your posts! I would really like to have the Ruby Goblets. Thanks for such a great giveaway! Dinnerware Set, 16 Pc. for my Christmas dinner. I'd really like to have the Bali Blue or Nuance of Sage collections. I love my Pfaltzgraff! I have had it for years! The only thing thats missing from it is christmas additions. So that is what I would like. All of those Santa's lol! I also love their Winterwood collection! 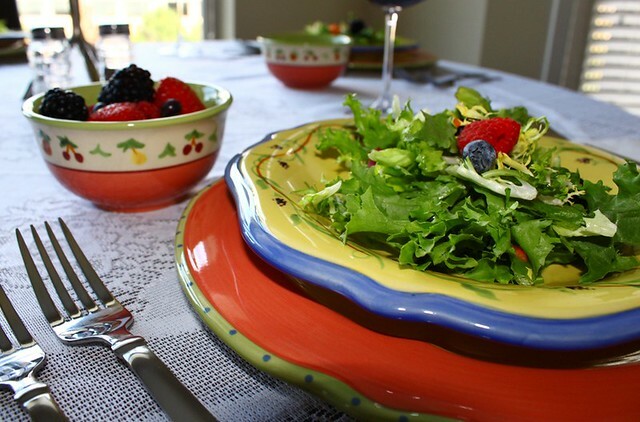 I'd love to have the Evergreen Ernie Dinnerware Set! It's got snowmans and snowflakes on it, so cute! I have always wanted white dishes so I can change them up with different colors napkins, tablecloths etc. They would be perfect for any occasion or holiday! 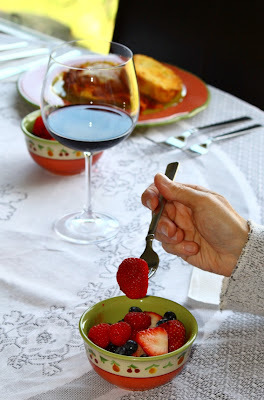 Loving the winterberry wine glasses!! Loving those red goblets! And I saw a Santa or two that I would love to have. I LOVE the Winterberry line! I like the Butterfly wine rack! love Love LOVE the Villa della luna pattern! 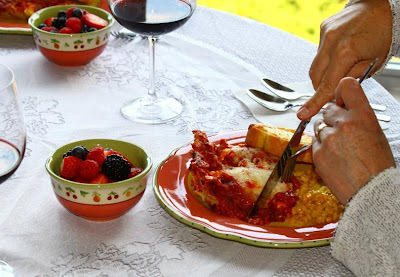 I'd love to have the Winterberry pattern dinnerware Service For 8 with Serving Bowl and Platter..it's so festive! I also like the Perfect Brownie Pans! pattern of dinnerware. Thanks for a great giveaway! 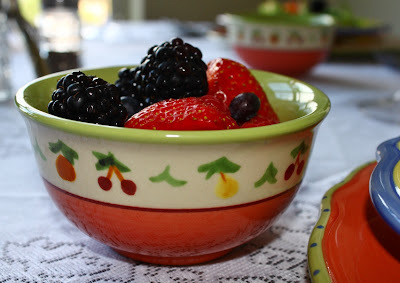 I would also love to have the Red Berries Dinnerware set. I love mugs so I love the On Deck Collection. I love their matching pitcher and creamer/sugar bowl set. I like the yorktowne platter. I like the villa della set too, the pasta jar is pretty! 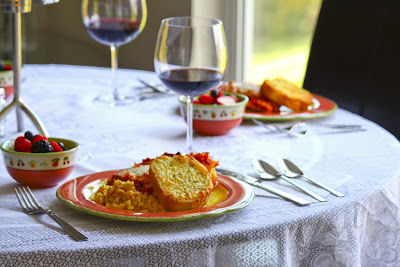 I really love the Winterberry Square dinnerware set. I'd like to have the Pistoulet set of three oval dishes. I love the Christmas patterns. I also would like to see if could get replacements for broken pieces from my wedding set. I would love the grapevine set! I really like the Naturewood Holiday pattern. 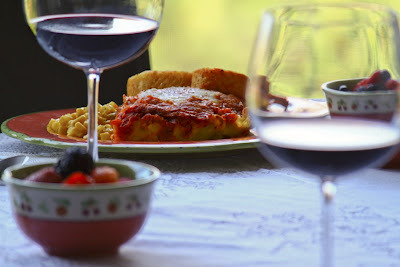 I love their flatware, too but it's a little out of my price range :) Thanks for the giveaway! I'd LOVE to have the midnight sun pattern set! I love the Laguna pattern! I also like the Double Walled Stainless Steel Thermal Mugs. They look very sturdy and heavy. I would love to have the Square Platter - Snowman! I would like to have the stock pot. I'd like to get the Eastside dinnerware set. I like the Lila Dinnerware set.